Sub-£100 DVD decks are all well and good, but often light on features. If you can raise your budget a little, you get more for your money - as shown by this £130 DV-696AV. 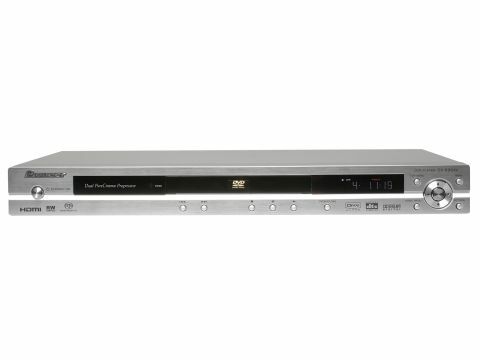 Just look at its credentials: DVD-Audio and SACD playback, DivX Ultra support, video upscaling to 720p and 1080i and a built-in Dolby Digital decoder. It context, this is a true bargain. Pioneer hasn't compromised on build quality or aesthetics. The understated yet refined silver finish and uncluttered fascia make it a real looker, and its 50mm height means you shouldn't have any trouble slotting it into your system. It doesn't skimp on sockets either. Alongside the HDMI output is progressive scan component video, an RGB- capable Scart and both flavours of digital audio output. You'll also find 5.1-channel phono outputs for multi-channel DVD-Audio and SACD playback and decoded Dolby Digital. We can't fault performance, whether you're using 720p, 1080i or even the RGB Scart and component outputs. With 720p, the Pioneer really brings movies to life. Tricky dark scenes are handled convincingly, detail is high and colours rich. Scart and component pictures share many of these qualities. Sonically, the deck's CD playback is impressive, but not class-leading. DVD, DVD-Audio and SACD playback are excellent though. Overall, the DV696AV is a bargain, with superb pictures and a great feature list.